Helping Christians apply the Word of God to all | Chalcedon Foundation Book Review of "Spartan and the Green Egg: The Poachers of Tiger Mountain"
Book Review of "Spartan and the Green Egg: The Poachers of Tiger Mountain"
We really have to do better than this, when it comes to providing children with light reading. Okay, I’m prejudiced against “graphic novels.” I see them as overpriced comic books; and comic books themselves are overpriced, these days. But it’s what’s inside that counts. This is the fourth book in a series: a hardcover comic book only 79 pages long. A ten-year-old could easily read it in a sitting, and he wouldn’t be much wiser for it. 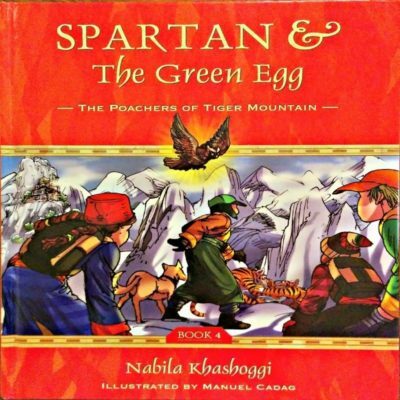 The premise of the story is that “Spartan” and his friends have a spaceship called “the Green Egg” that can take them anywhere in the world, and then they have adventures. This time out, they go to Bhutan to save tiger cubs from poachers. Thing is, “Egg” is sort of a god. Whatever the kids need or want at any moment, wherever they are, all they have to do is ask Egg for it and they get it—no matter how badly it violates the laws of nature, no matter how impossible or unreasonable, Egg provides it. Instantly. The girl falls off a cliff? No problem! Spartan just cries out to Egg to turn the jagged rocks below into nice, soft guacamole, and we have a safe and happy landing. The poor Bhutanese food is inedible? Again, no problem. Egg instantaneously conjures up a whole wagonload of fresh, delicious food, enough for everybody. Where did that come from? Don’t ask me. After a few such incidents, we begin to suspect that Egg—which, after all, is a piece of sophisticated technology, not really a living person—is, well, omnipotent. And if that weren’t enough, the kids themselves carry hi-tech gizmos which allow them to do all sorts of things that look like magic: for instance, when they need a bridge across a gorge, all they’ve got to do is draw one on the girl’s sort-of magical drawing pad and it instantly becomes a physical reality. And they can just as easily make the bridge disappear, foiling the inept poachers who are chasing them. We don’t want our children reading stories that seriously subject them to anxiety; but all the stuff in this book makes any kind of suspense impossible. What, me worry? There’s nothing Egg can’t do! Children can’t understand a thing like this, but to an adult, the idea of a god who instantly grants anything you wish for slowly builds into a rather dreadful concept. Egg is such a god. Egg is at least the genie in the magic lamp. The true God knows us better than we know ourselves, He is righteous, He is loving, and He certainly knows better than to give us anything we want whenever we want it. Having Him at our beck and call like that would, in a way, turn us into gods ourselves: the next best thing to having omnipotence is to have unrestricted use of it. I found myself wondering what would happen if someone said, “Egg, give me a load of drugs I can sell on the street,” or “Egg, give me a supercharged Maserati with a full tank of gas.” The children in this story are all goody two-shoes-type characters who would never ask Egg for anything wicked or destructive. So you see it’s perfectly safe to trust them with what amounts to virtually absolute power! We are at liberty to doubt it. Another point: a lot of children are already immersed up to their eyeballs in this-phone, that-phone, video games, and other pieces of technology—so much so, that a few adults have begun to worry about it. Just how dependent do we want kids to be on gadgets? And what do we want kids to expect from gadgets? The answer to life’s problems—or maybe a total avoidance of life’s problems? And, as is so often the case in secular children’s literature, parents and family are absent from the scene. I wonder what my mother would say if I told her, “We’re going up to Bhutan today, in the Himalayas, to play with tigers and fight armed poachers who wouldn’t think twice about shooting us.” Somehow I don’t think she’d be on board with that. But Spartan and his friends apparently have really laissez-faire parents—although one of the kids is worried about having to put his video game console back together, because, “If my Mom finds out that I took it apart after only having it two weeks, she’ll go nuts!” Maybe there are a lot of things these kids’ moms don’t know. But the biggest lesson taught by public school, in which this book seems to concur, is that the most important people in your life are not your parents or your family, but your age-group peers. Your “friends.” The ones who really understand you. If we had to name which single notion has done the most damage to our culture, this one would be a strong candidate. What we have here is a bunch of kids under no parental supervision, wedded to technology to the point where they put absolute trust in it, just zipping all around the world in a space ship, having adventures in which technology makes it impossible for them to get hurt, or fail. Does this sound entirely wholesome to you? I grew up on children’s classics, like Black Beauty and Hans Brinker—and, yes, stacks and stacks of Disney comic books. All of it was much, much meatier than this. I’m always surprised when someone tells me that his six-year-old or eight-year-old greatly enjoys my books. I write them with an audience of twelve-year-olds in mind, always trying hard not to lose the adult readers along the way. The point is, young children—if they haven’t yet been thoroughly dumbed down by school and culture—don’t have to be fed a steady diet of simple-minded pap. They can enjoy some of the same stories at ten years old that they’ll still enjoy at sixty (C.S. Lewis’ The Chronicles of Narnia spring to mind)—because a good story is a good story. Judging by this one example, the “Spartan” books are twaddle with some not-so-nice undertones. I would not pass it on to children. It really shouldn’t be hard to find something better than this.